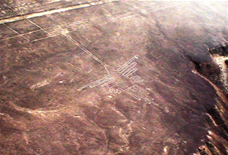 The Nazca Lines: The letter of the ancient Peruvians. The ancient Peruvian cultures have left evidence of their knowledge of nature and his inner world. Not on papyrus or clay tablets or silk, if not in the walls of their temples, ceramics, textiles and their soil, they learned to master to get their food. The Nazca Lines are a sign of that wisdom so far enigmatic and indecipherable that the ancient Peruvians came to have more than 8000 years of cultural development. It can be defined to the Nasca Lines as a set of straight lines, geometric shapes and patterns that are located at 420 kms. south of Lima, on the Pampas de Jumana desert, between the towns of San Jose and Palpa, which belong to the provinces of Nasca and Palpa respectively, in the present department of Ica. These graphics on the earth are a great scientific and artistic work of Culture Nasca; ancient society of the Peruvian coast which originated in the Rio Grande valley, and extended into the river valleys of Chincha (Ica) to the north; and Acari (in Arequipa) to the south, between 100 BC and 600 AD. being located within the historical period called the Early Intermediate, according to the periodization of pre-columbian history of Peru raised by the american archaeologist John Rowe in 1951. - Made the best and finest pottery decorated Pre-Columbian America. - Constructed the city of Cahuachi, which has a stepped truncated pyramid 28 meters high. - Evolved from a theocratic society, a society ruled by the military, as evidenced by the walls surrounding the city of Cachuachi and "trophy heads" possibly Nazca warriors had tied them to capture the soul of the defeated and thus become more powerful. - Build an efficient and complex network of irrigation channels (forty or so) that allowed them to use water from rivers and groundwater. But the Nazca Lines are undoubtedly its most impressive effort by the magnitude of its inhabitants who used them, and the arcane knowledge that motivated them to create them. While there is a brief mention of them in the "Chronicle of Peru," written by Pedro Cieza de Leon in 1547, these were rediscovered and made available at the XXVII International Congress of Americanists (held in Lima in 1939), by the researcher Toribio Mejia Peru Xesspe, attracting the interest of Paul Kosok (professor at the University of New York Long Island), who began to study them in depth, until 1946, when he returned to the United States and instructed his assistant, at the time, german mathematics professor Maria Reiche, to continue with investigations. Many hypotheses have been proposed to explain the reason and purpose for which the ancient people of Nazca made those lines. For Mejia Xesspe were old roads through which the inhabitants of Nasca could find water reserves (called Ceques), however, to Kosok lines follow a path that coincides with changes in position of the sun at different times of year, mainly on the winter solstice (21 June) and summer (December 23), so that would be signs that served to mark important dates (such as a large calendar). But Maria Reiche, while supporting the hypothesis Kosok because next to the sixteen that she discovered drawings placed a marked line which he called "line of solstice" (because it coincides with the sunrise and sunset the sun in the winter solstice), she it goes further by proposing that rather than astronomical signs, could be a kind of writing, as these designs are repeated in various ceramics and textiles of the Nasca culture. 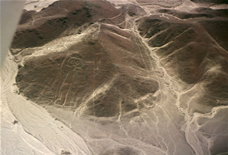 Thanks to their dedication and care, the Nazca Lines were declared Cultural Patrimony of Humanity by UNESCO in 1994. There is much to discover and decipher the history of pre-hispanic Peru, but there is no doubt that these and other works were made by the ancient peruvians in a logical and a science that is still hidden to us. The Nazca Lines Theories emerged because, according to dating, the 13 000 lines and 800 geogíficos range from 550 to 650 years A.C and the controversy over to identity of those who created the tracks and to know the real purpose of these enigmatic draws, that nowadays continue more relevant than ever. At first any archaeologist could explain the reason its existence, which led to different theories: one of these is the extraterrestrial theory suggested by an amateur archaeologist from Switzerland named Erich von Däniken, according to which the drawing was a track trapezoidal landing craft built by aliens who visited the Earth long time ago and the Giant portrayed in the hillside ("the Astronaut") is the figure of the alien testified by the Nazca. Far from being a great story, but perhaps the lines were not exactly landing strips, as suggested Däniken, this theory coincides with other somewhat similar traces of the "gods of old" left as testimony to that contact. After all ... lines can only be appreciated from the air. The theory most widely accepted by scientists is the theory of the calendar. According to Maria Reiche, the drawings are the schedule and map of the sky world's largest, the countless lines that cross the desert in all directions were used to observe the movements of the Sun and the Moon. Using this method the Nazca Indians could announce the change of seasons and use this knowledge for agriculture. Some animals drawn indicate the direction in which a large seasonal constellation can be seen. 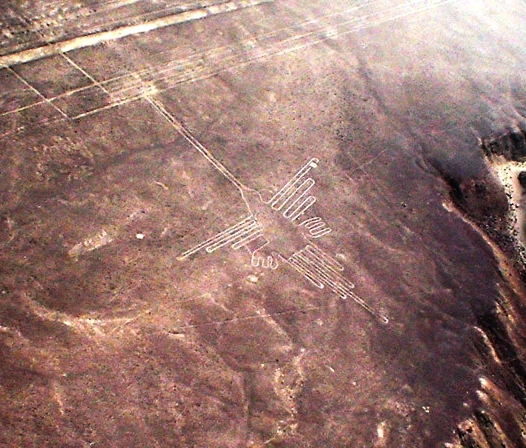 But some people disagree with this theory, a strong wind blowing Palaca called seasonal round in this region, it is often very foggy, but during the day is sunny in the morning and evening are usually covered, before sunrise or after sunset is too dark to see the drawings, in other words the Nazca desert is not ideal for making meteorological observations. Another of the many theories says that the answer lies in the Nazca pottery, which is one of the masterpieces of ancient Andean civilization. It is characterized by bright colors, all the gods designed Nazca pottery in their mouths are agricultural products, this shows the importance he gave this village to agriculture. All drawings of animals in the desert are repeated in ceramics. The only difference is that the drawings in the desert are made with a single unbroken line, another feature is that there is always a segment of the drawing that is open, and the drawings are made in one stroke without interruption. Land of Nazca is arid with no rain all year. From generation to generation have been survived working the little land on the banks of the river, planting appropriate to the sandy soil grains. The land is poor and dry, thanks to the wells were able to continue farming. The meaning of the Nazca drawings and the need for water would be another possibility. The mirage of water in the desert can be seen when the winds subside. The drawings of the desert are covered by this water phantom. This is precisely what the Nazca Indians must have seen. The multitude of lines in the desert were then ditches to channel water phantom, the drawings were made by a single line without breaks that could serve as receptacles for water. This is not all about the appearance of the mirage in December coincided with the arrival of "El Niño" phenomenon, every seven years. The dry climate that produces the Humboldt Current off the coast of Peru changes abruptly with the arrival of El Niño, moist air enters the coast bringing heavy rains in the interior. Although El Niño causes extensive damage to the world to Nazca Indians was an emissary who brought rain to the region, including 1,500 years ago the existence of El Niño was known. Was this what the Nazca expected, the life-giving water.